Article by Dan Hedges. Published in Sounds, March 26th 1977. Anthony Phillips has come to a gentlemanly halt in mid-sentence, and he's looking a mite perturbed. His tie's on straight. His beard's neatly trimmed. The colours of his pullover are clear and bright. But he can't get the damned pipe lit - and that's not good at all. It suits him though (the pipe, that is). Very civilised, you know. Kind of rounds out the image. 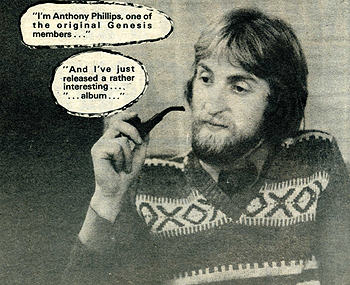 A. Phillips could easily pass for a schoolteacher, a cricketer - or, for that matter, even one of the guys in Genesis - which he was, once upon a time. Yeah, it's the same A. Phillips who once shared Messrs. Gabriel, Banks and Rutherford's dream of writing hit singles for Dusty Springfield. The very same A. Phillips who hung around long enough to record "From Genesis To Revelation" and "Trespass" with them, before clearing off to the furthest reaches of Who-Knows-Where. He's back now - not with Genesis, but in the highly respectable guise of the solo artiste, with an album called "The Geese And The Ghost" tucked under his arm. Got it? Fine. But then, a bit of 'historical perspective' seems called for. Seven years is a long time to be away, even if he wasn't exactly contemplating his navel during the long absence. He'll probably explain it all as soon as he gets that pipe lit. Ah...no, wait a minute...yes, he's got it. Okay, here we go. "I left Genesis in a cloud of dust. I remember I was listening to Sibelius when I had one of those strange revelations - that I was terribly limited. Here was this one man invoking these incredible effects. I'm not denigrating Genesis, but it was something far greater than what we'd just recorded, which was "Trespass". "I thought, 'Hold on, this one man's got this incredible power at his fingertips' - which was the orchestra, and I suddenly felt so narrow as a musician. I guess I'd been suffering from the delusion that a lot of us suffer from, which was that 'classical music', as a blanket term, was dry, academic stuff. the kind of thing that people slept through. "But I suddenly started discovering all this amazing music and realising that I was terribly limited. My guitar playing was limited, and I couldn't play the piano at all, so I set to it. In the time since I left Genesis, I've studied classical guitar, piano and orchestration. I'm a glutton for hard work - I don't do thing by halves - and it was really heavy. You can call it my 'student period' if you like. It was a self-imposed exile of four years." Anthony stayed in close touch with Mike Rutherford. Somewhere along the line, they hatched vague plans for a joint album, based around the pieces they'd been working out on 12-string guitars since before the formation of Genesis. Work began on a more or less home-made/part-time basis using four-track tape machines - though as Mike's touring commitments began taking up more and more of his time, Anthony gradually took the whole project on as his own. As his knowledge of orchestration grew along with his expertise on the piano, the basic 12-string guitar concept was expanded - and "The Geese And The Ghost" is the end result. It's civilised music, if you catch my drift. Elegant. Wistful. Graceful. Tasteful.. Quiet, subdued and fragile - lots of twinkling 6 and 12-string guitars, and hazy, quiet orchestrations. Phil Collins is guest vocalist on two tracks, but eighty percent of the album is straight instrumental music. Phillips, Rutherford and a handful of friends. There's a lot of space though. "It's funny, because Peter Gabriel was the one person in Genesis who was supposed to have this preoccupation with space, but I don't have any preconceptions. It's no guiding light. "There are two ways of doing it. One is the scoring technique, where you score for stock instruments - orchestral instruments - and you can predict everything. The other way is, in a way, a cop-out and time consuming, but that's to fiddle at the right sound - and this is what Mike and I did. But by fiddling around, you can combine three or four instruments or sounds and produce a new instrument of indefinable quality. In a sense, you're making history, because you're discovering something which could be completely original. "This album sat on the shelf for a year because people considered it to be "pleasant" and "euphoric" but not instant... Everyone said, 'Yeah, it's very nice, but we can't do a thing with it'. It's a question of doing the right thing at the right time. I've got a whole load of material I've recorded at home - basically solos and duets using 12-string and classical guitars, and piano. I'd love to put it out, but it's not the right time. In no way could it be a follow-up to this, because what people will expect from me next is a bit more immediacy and oomph." It's strange, but Anthony gives the impression that he's already relegated "The Geese And The Ghost" to the past. Now that it's finished, he seems perfectly willing to forget about it completely, though he's got to grit his teeth for a forthcoming promotional trip to America. Genesis' success over there will be an obvious asset in selling the album, but he admits that he's a bit worried about being connected too closely with them. "It's a difficult thing. Obviously at times, I'd like to be totally separate from it, but that's unrealistic. Mike's on it, and his influence is important and enduring. He's part of Genesis and I was, so it's going to be mentioned. This album will have to go out under that shadow, but it'll have to be done away with for future albums."